For the sixth consecutive year, IFOA is proud to present the works nominated for the Rogers Writers’ Trust Fiction Prize. Author Helen Humphreys hosts. Finalists will be announced October 1! Helen Humphreys is the award-winning, bestselling author of four books of poetry, six novels and two work of creative non-fiction. She is the recipient of a City of Toronto Book Award, the Rogers Writers’ Trust Fiction Prize and the Canadian Authors Association Award for Poetry. She was awarded the Harbourfront Festival Prize for literary excellence in 2009. Humphreys presents her haunting memoir, Nocturne: On The Life And Death Of My Brother, an intimate self-examination and exploration of her grief after the sudden death of her younger brother, Martin. Authors Helen Humphreys, Kathryn Kuitenbrouwer and Lois Leveen read from and discuss their latest novels at the Knox Presbyterian Church in Woodstock. For tickets and more information, visit the Woodstock Public Library (519-539-4801). John Moss, Still Waters. ; Roy MacSkimming, Macdonald, a Novel. ; Elizabeth Kelly, Apologize, Apologize!. ; Helen Humphreys, Coventry: A Novel. Helen Humphreys was born in 1961 in England and moved to Canada when she was a young girl. She was kicked out of high school in grade 10 and attended an alternative school to finish her education. Humphreys lives in Kingston, Ontario. Helen Humphreys's book Coventry: A Novel was available from LibraryThing Early Reviewers. 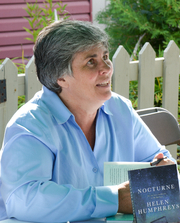 Helen Humphreys is currently considered a "single author." If one or more works are by a distinct, homonymous authors, go ahead and split the author. Helen Humphreys is composed of 3 names. You can examine and separate out names.